Scientists in Italy have combined nanoparticle receptors with NMR spectroscopy to detect and identify new psychoactive substances in complex mixtures. Last year the European Union drugs agency reported that new psychoactive substances, or so-called legal highs, were surfacing on a weekly basis. Typically, clandestine chemists make these new substances by modifying known molecules. ‘The problem [with synthetic drug abuse] arises because the ingenuity of the synthetic chemist permits the creation of new psychotropic substances faster than the analytical scientist can devise methods of their specific detection, faster than the toxicologist can identify and quantify their effects on the body, and certainly faster than the legal system is able to regulate their use,’ comments Robert Hillman, a chemistry and forensics expert at the University of Leicester, UK, who was not involved in the research. Whilst NMR can characterise new molecules, recreational drugs often contain an active ingredient mixed with several substances to enhance their effects or increase profits, which complicates and prolongs the process. To address this issue, Fabrizio Mancin and colleagues at the University of Padova have developed a technique to detect and identify likely psychoactive substances at micromolar concentrations in complex mixtures. To detect these designer drugs, Mancin’s team focused on the phenethylamine backbone often present in these substances. At a physiological pH these drugs have an amphiphilic structure, so they designed monolayer protected gold nanoparticles with thiol groups that responded to the phenethylamine derivatives. 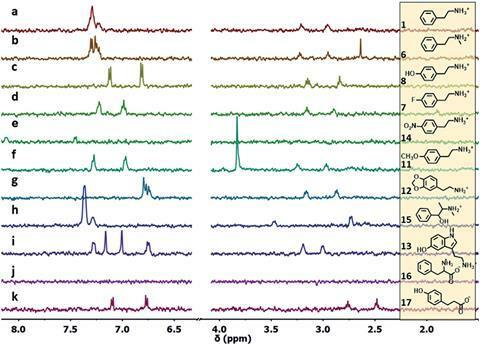 When using NMR spectroscopy in combination with these nanoparticle receptors, only signals from the molecules flagged by the receptors appeared in the NMR spectra, making them much easier to characterise. ‘The attraction of this chemosensing approach is the promise of being able to identify the structure of a new drug very rapidly from a drug seizure, for example in the form of a single tablet,’ comments Hillman. 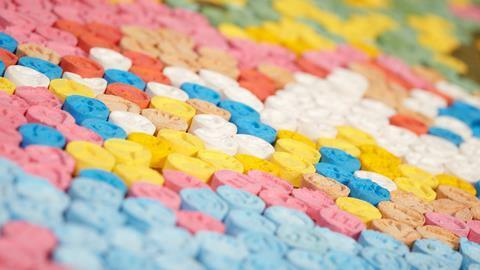 The team initially tested their technique on molecules with similar structures to psychoactive drugs, such as neurotransmitters and drug precursors, before applying it to a street tablet. They rapidly identified MDMA in the tablet. Whilst the team were unable to apply the technique to any new designer drugs, due to legal regulations, they are confident that the technique is robust against chemical modification on various peripheral sites.